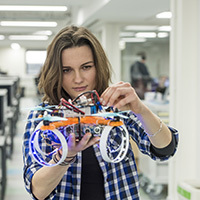 Throughout Electronics and Computer Science (ECS), women are carrying out ground-breaking work in academic and industrial research and inspiring the next generation to discover the amazing career opportunities available to girls in these exciting fields. 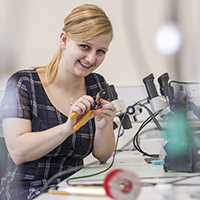 Meet some of the academics and students in Electronics and Computer Science and find out what inspired them to study and undertake a career in engineering. One of the first computer scientists to undertake serious research in multimedia and hypermedia, she has been at its forefront ever since. 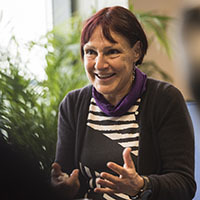 The influence of her work has been significant in many areas including digital libraries, the development of the Semantic Web, and the emerging research discipline of Web Science. She is the UK's only Regius Professor in Computer Science and has led a major review of Artificial Intelligence for the UK Government. Read more about Monika here. Age is an Associate Professor and Admissions Tutor for our undergraduate Computer Science degrees. A specialist in information management and database technologies, she is an award-winning researcher for her work on provenance. She is exploring ways to allow users to discover and assess if data is fit for purpose in fields as diverse as food security, disaster response and counter terrorism. Age is as passionate about education as she is about her research and teaches on undergraduate modules including games design and development, professional development and software engineering group projects. Elena is a Professor of Computer Science in the Web and Internet Science research group. Her primary research interests are at the intersection between AI, knowledge technologies, social computing, and crowdsourcing and is currently working with the newly launched EU Blockchain Observatory and Forum. Recently, she launched Data Pitch, a Europe-wide project that will provide startup companies with world-class business support including up to €100k funding and expert mentoring. Su White is an associate professor who researches in the Web and Internet Science research group and is co-director of the University’s MOOC Observatory. 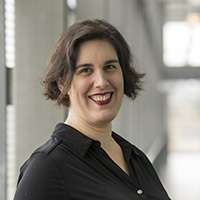 Her research interests also encompass associated Web science and education agendas of digital literacies, learning in a connected world, open data for education and perspectives on STEM education. Su actively is a member of the WISET committee and has been instrumental in establishing and supporting ECS Women and the ECS Student Society. Wen Yee spent the first two years of her degree at the University's Malaysia campus and the final two years of her studies are in Southampton. 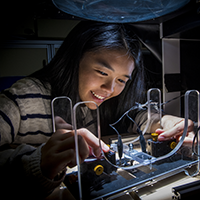 Her current focus is on modelling solar cells. She says, "I have great interest in solar cells. I want to improve the current solar cell efficiency and bring the technology to Malaysia to make good use of the sufficient sunlight which is available all year round. By doing so, environmental issues like global warming can be reduced." Read more about Wen Yee here. 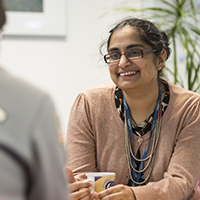 After her BSC in Information Technology in Organisations, Reena stayed on in ECS to do a PhD focusing on computer science experience and how get girls into computing. 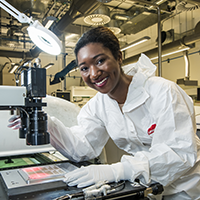 She has been Coordinator of women’s networking group Theano, a research fellow, and is now Outreach Coordinator for ECS, winning a Women in Science, Engineering and Technology (WiSET) Award for increasing the visibility of women in STEM. “My study focused on power engineering. Renewable energies are becoming an ever-increasing presence in our electricity network so it is important that power engineering is studied to ensure that power systems evolve with the changes in generation. I would love to see the gender gap in engineering shift as more girls consider maths and physics as a rewarding and exciting career prospect. After graduation I would like to promote Engineering and see applications to study it at degree increase from both genders." Read more about Rebekah here. Tech innovator Sanaz Yeganefard, has been highlighted for her dynamic impact in industry through a TechWomen100 award – January 2018. This award recognises successful and influential women that are excelling across the UK in tech roles. 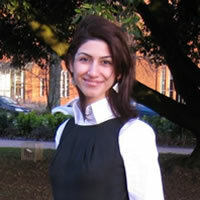 Sanaz completed an MSc in Software Engineering at Southampton in 2009 before developing mathematical modelling techniques for automotive control systems through a PhD in the current Cyber Physical Systems research group. 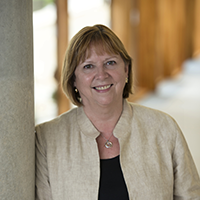 She has since designed and developed systems for top UK banks, building societies and retailers that have improved productivity and lowered costs. Read more about Sanaz here.